Futurama: "Fry Am The Egg Man"
"Fry Am The Egg Man"
Question: In school, did any of you do that parenting assignment where you're given an egg or a sack of flour for a week and told to take care of it, to show just how hard it is to protect something that's easy to lose track of? I didn't, but I've seen it come up in a lot of movies and TV shows, and I'm curious if I missed out on something. 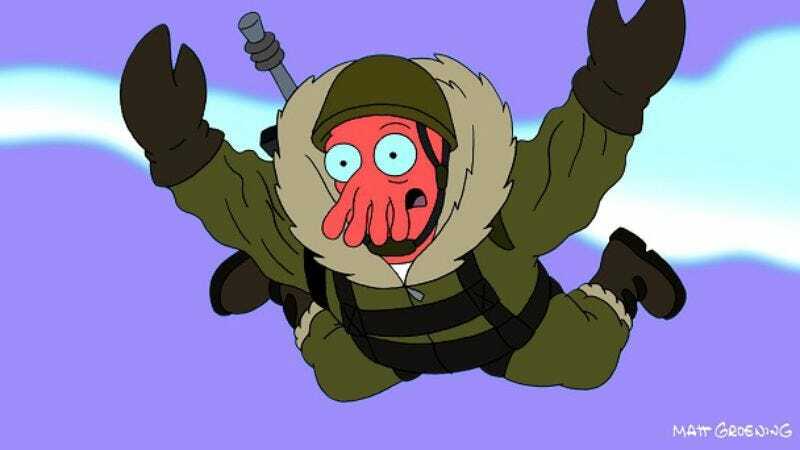 Tonight's Futurama, "Fry Am the Egg Man," had me thinking about this, during a montage of Fry trying to protect a fertile egg of an alien species, with predictable results. What always struck me as odd was how superfluous the whole flour bag experiment seemed. It doesn't really teach anyone anything beyond the obvious idea that taking care of a precious object, even an inanimate one, isn't easy. And anyway, as Fry clumsily demonstrates, the urge to protect isn't a a rational one: It's love. Sloppy, unconditional, borderline mentally deficient love. Futurama has done a dangerous pet episode before. Nibbler (who, I guess, is on vacation now? ), Leela's constant companion from the first season on, had a habit of eating live animals whole, and while he later turned out to be a member of a race of super-advanced, crazy adorable galactic guardians who had arranged for Fry to be sent to the year 3000 in order that he could sleep with his grandmother and save the galaxy from a race of evil, intelligence sucking brain monsters, there was some resistance to Nibbler's presence in his debut. And we've also had an episode about Fry's attachment to animal companions, in the heartbreaking "Jurassic Bark." But "Fry Am The Egg Man" managed to feel fresh enough, with a great monster-pet and a lot of silly jabs at fast-food, organic farming, and Scottish peasants. Exhausted after a mission to a planet full of murderous pogo-bots, the Planet Express team grabs a bite to eat at Fishy Joe's. (Their motto: "Come for the food, then get the hell out.") Leela, after a failed attempted to take the healthy option on the menu (a "Froot" cup), decides it's high time she, and by extension everyone else, starts eating healthier. So they take a trip to the nearest Farmer's Market ("One galaxy over"), where Leela, entranced by the grubby, bug infested produce, buys a bushel of Heirloom Eggs. But Fry, in a characteristic outburst of misguided but endearing idealism, takes a shine to one of the eggs, saving it from scrambling. He sets to work hatching it, but when the baby in the egg does finally break free, it's a horrible, acid spewing monster. Fry resolves to protect him (aka, Mr. Peppy) anyway, and the rest of the team accepts this, until Dr. Farnsworth discovers the creature is a Bone Vampire, which eats bones, and reproduces asexually. There are a lot of familiar elements here, but "Egg Man" puts them together well, staying true to its characters and still managing to deliver a surprisingly happy ending. The big success here is Mr. Peppy. The episode could've tried to play up the contrast between Fry's perpetual, unquestioning affection for the animal by making Peppy as cold and violent as possible; instead, the bone vampire is about as lovable as bone vampires get, despite still eating bones and having acidic saliva. (One of the episode's best, most uncomfortable gags is the way Peppy repeatedly injures Fry whenever it tries to show him affection.) 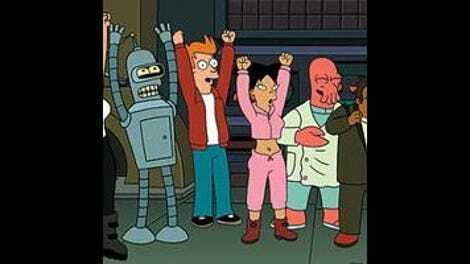 Knowing that Futurama is more than willing to murder its non-recurring characters for the sake of a bit, Mr. Peppy is never really safe; so while it would be going too far to say "Egg Man" was a master class in suspense or anything, Peppy's basic good nature meant that his fate was both in question and important. Futurama often walks the line between cynicism and nihilism, and the show works better when it doesn't entirely surrender to contempt. There was no deep soul-searching tonight, or a fantastic, mind-blowing premise, but this is one of my favorite episodes of the new season so far: frequently snicker-worthy, a little bit sweet, and engaging throughout. The Amazonians return! "I'm scare-roused!" "But you can't sit on something for a week without falling in love with it." "That depends on what sort of thing that thing is. That seems like a thing worth knowing." "Its brain is the size of a walnut!" "So are walnuts, and they're delicious!" I'm also a sucker for a Scooby-Doo gag.